About a year ago I was appointed by Master Li Jung Feng, the founder of the Sheng Zhen Gong method and head of the international Sheng Zhen Gong Society, to lead and represent the organization in Israel. During this year I dedicated my time, together with others who are committed to the practice, to develop and promote the organization's activities. One important activity was redesigning the website, and it is now about to be launched. I have the pleasure and the honor to thank with appreciation all those who helped, worked and contributed to the new website. I invite you all – partners and friends in the practice and spirit of Sheng Zhen Gong, and anyone interested in joining us – to visit the website, browse the wealth of information it contains, and find out about our activities in Israel. I hope to see you with us – at our practice gatherings, workshops and weekly classes. 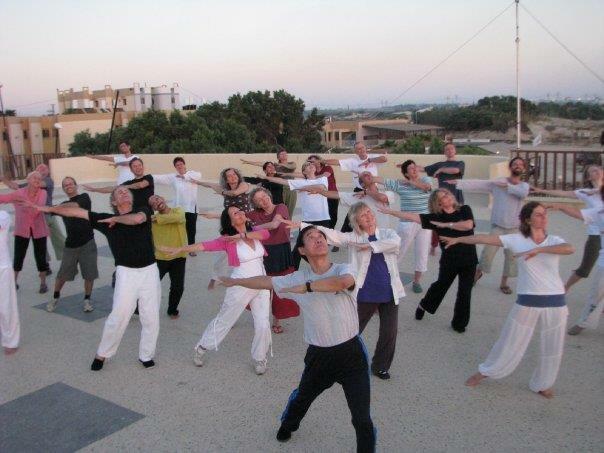 The meaning of qigong is working with qi, the energy of life. The origin of the practice is in ancient Chinese culture. It is the art of movement that is the basis of tai chi (the Chinese martial art that develops soft power). Qigong is also one of the tools of Chinese medicine. Some people call it Chinese yoga. In the practice we learn to feel and move the inner energy of the body. Qigong is a mind-body practice which cultivates health through using the movement of the body as an object of meditation. Sheng Zhen Gong is one of many methods and forms of qigong. The meaning of Sheng Zhen is unconditional love. What is special about it is that it combines work on the physical and emotional levels with the spiritual level that connects us to the universe, to something greater than our self. Sheng Zhen Gong is a contemporary creation based on classic qigong, that relates to our needs as human beings living in the 21st century. It cultivates the qualities of the heart and strengthens the energetic system of the heart. It is a qigong for opening the heart. The philosophy is 'love thy neighbor as thy self'. The wisdom is born through the movement of the body. Why do we practice Sheng Zhen Gong? For many of us, our first encounter with Sheng Zhen Gong was like falling in love. The practice brought an experience of personal development, and a sense of balance and integration. It is not a matter of belief but of experience. It cannot be understood rationally, one has to try and experience it for one self. The practice contributes to physical health, and the physical health is connected with emotional and mental health. In the western world there is much tension, worry and depression. The practice relaxes the body and the muscles, and reduces pressure and stress. The body synchronizes and the qi flows. The relaxation and opening of the body calm the feelings and thoughts. There is less blockage and more joy. to the universe. The practice brings joy of life, and the attitude to life changes. What is the purpose of Sheng Zhen Gong? On one level the purpose of the practice is to connect the self with the external world and the universe, through inner work. On another level, the purpose is to be better human beings, to feel our connection with a wholeness from which we came and to which we shall return, and to take care of our selves, our environment, and the planet earth.